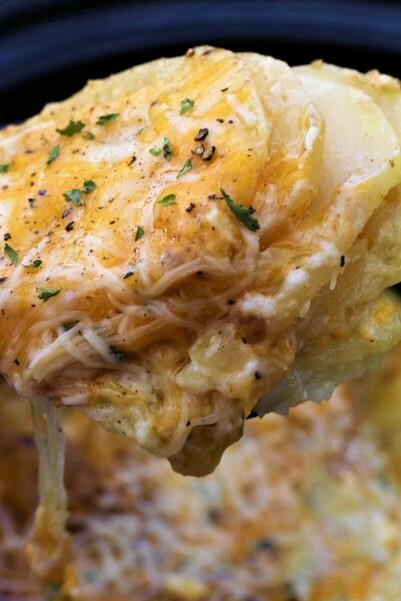 Cheesy crock pot au gratin potatoes are the best side dish for any meal. They are creamy and topped off with cheese. Mmmm, so delicious. They make a great contribution to any dinner, or if you want you could even just eat them with a vegetable. Do you love making dinner a little easier? Then this is a great recipe for you to try! How I love when you can make dinner easier. So many times it is really hard to think up some wonderful ides for dinner. 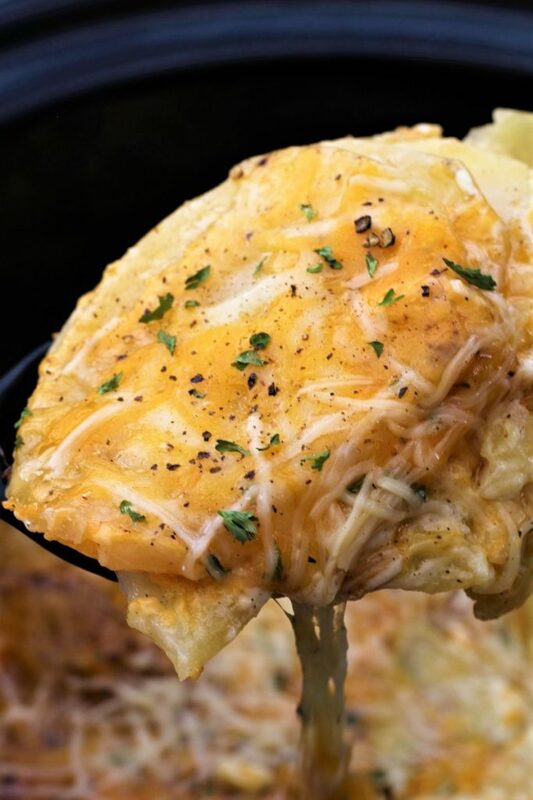 Cheesy crock pot au gratin potatoes are perfect. I also love leftovers. They store so easily and they go with so many different dishes. I think one of my favorites is ham. They make a dinner complete when you have cheesy crock pot au gratin potatoes, ham, a vegetable and if you want, you could add a nice roll. For about the last 15 years, we have done a fundraiser to help pay for our kids scout camp. We would hook up the trailer and head to Idaho. Then we would buy 200, 50# bags of potatoes. Then we brought them back home and deliver them around the neighborhood. Those who had ordered them, would get first dibs and then if there was extra, we would sell the rest of the potatoes. We usually kept 3 bags for ourselves. Like a lot of the families in the neighborhood, we don’t need that many potatoes this year, since we don’t have as many children at home anymore. But I tell my husband, that I need potatoes from Idaho. We both grew up in Idaho and we really miss those famous Idaho potatoes. So when I got my 50 pound bag of Russet potatoes, I knew that I just had to make some potatoes in the crock pot. I like that you can put them in and leave them. When they are done, they come out perfect and delicious. However, I did have to laugh because when my son came home from work, he told me that the house stunk (garlic) and that we needed to get something that made our house smell like pumpkin!!! I guess I will have to find a candle because if I make pumpkin treats all the time I will be in trouble. They are some of my favorites! Just look how big these potatoes are!! I love peeling these bad boys! So much easier than those little pebble sized potatoes. How I love when the Fall comes around and the new potatoes are available. Like I said, I did use Russet potatoes, but you can use Reds or even Yukon golds. I guess that we are use to the Russet potatoes, because that is what we grew up with. 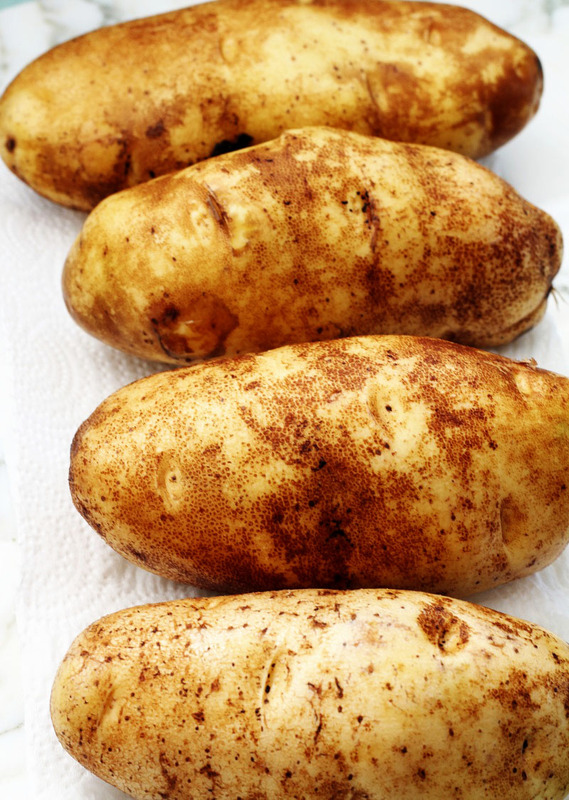 Even my husband grew up with Russets, and he raised potatoes in his younger years. However, I do love the reds with a little bit of skin left on them and country gravy on top! 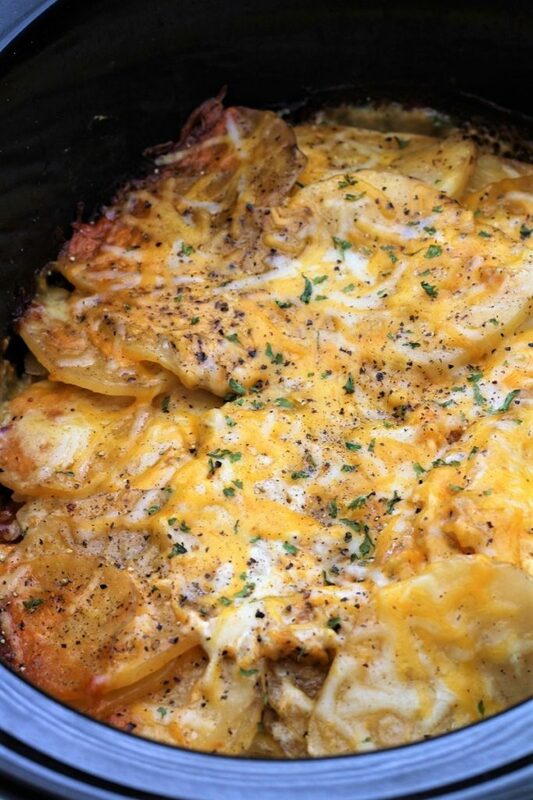 I invite you to try this cheesy crock pot au gratin potatoes recipe and I hope that you will enjoy it as much as we do! 1- Slice the potatoes pretty thin as they will cook better; about 1/8th inch thick. 2- Make sure that you use cream so that your potatoes will be creamy. In a medium sauce pan, place cream, flour, garlic, rosemary or thyme and dried onion. Warm until it is heated through on medium heat, stirring constantly (mine took about 4 minutes). Place the tablespoon of butter on the bottom of the crock pot. Peel and slice the potatoes. I had about 4½ - 5 cups of potatoes. Place ⅓ of the potatoes in the crock pot. Pour ⅓ of the cream mixture over the potatoes. Then sprinkle with salt and pepper, then add ⅓ of the cheese. Repeat 2 more times (potatoes, cream mixture, salt, pepper and cheese). Place the lid on and cook on high for 4 - 5 hours depending on your crock pot. Check to make sure potatoes are tender. Sprinkle with the Parmesan, replace the lid and cook until the cheese melts.